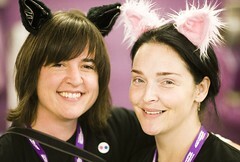 George Oates and Heather Champ of Flickr modelling our clip-on kitty ears at the Maker Faire. Aren't they adorable? These are not up on bunnywarez.com yet but I wanted to show them off. They come with the good kind of clips, that stay in really well (even in short hair) and do not break off your hair. We have a plethora of color options, so if you are interested, drop us an email. Cost is $10 a pair, and if you would like a matching tail, there is a discount! Bear ears. I want/need bear ears. Oh, we can definitely do bear ears! They'll be perfect for the playa. What color do you want? Also, do you actually have a mohawk? Looking forward to meeting in person! If you want to order, drop an email to bunny-at-bunnywarez(dotcom) and let me know what color you want for the inside and outside of the ears and I'll email you back to firm up the details. scroll down to see the logo bunny. We have a variation in black fleece with charcoal inner ear accents (and no face) which we can make with or without the attatched ninja mask. All of our fleece bunny hats have stash pockets in the ears, with velcro closure - the perfect place to hide your carrots! That is an incredibly surreal picture. Aren't they cute kitties? They were saying that they wanted them because there are soo many photos of people's cats on Flickr, that sometimes it seems like it's just a big kitty cat photo server. The pink ears are made out of that same pink fluffy fur. Oh and when are we going to meet up? I still have a present for you, for helping us out so much at FC! I dunno! When are you and Jovino free? Are you going to Howwierd Street Fair? We are actually planning on the how weird fair, so maybe we can meet up there. Any idea what time you plan to be there? Or should we just try to coordinate via celphones? we'll be there 1ish. I shall call ya. That is SUPER RAD! Yeah, it's got its challenges, but overall we are lovong it. I know exactly who you are talking about too. She bought the hat and then her daughter put it on and refused to take it off, so she came back to order one for the daughter. I really hope they send us a photo of the two of them for our web gallery... I'm sure it would be incredibly adorable. Hope to run into you again soon... it has been a while.